Talented muralist, Audrey Sterk, provides American made, eco-friendly decor with an artist's touch! (3BL Media ) March 7, 2012 -- “Everything I do starts with a pencil or paint brush,” said Audrey Sterk while speaking of her collection of uniquely patterned home furniture and accessories. A trained muralist, Audrey wanted to develop an line of wallpaper and home products that would give an artistic touch to every home. We couldn't help but be intrigued by her "pattern first" approach to design. And we were totally captivated by this Circle & Star Canvas Wrapped Table, our Greenspiration Home Amerian Made Pick-of-the-Week. The table, which was recently featured on HGTV’s “Green Home” program, is based on a simple, parson-style design and can be wrapped in any one of Audrey’s signature patterns. 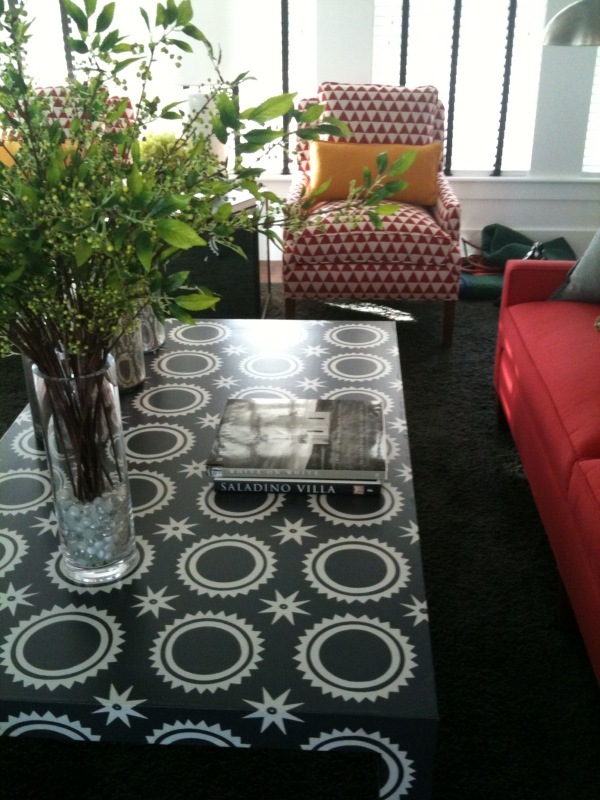 We loved the charcoal and cream “Circle & Star” pattern which can be applied to tables, floor cloths, and other items from the Audrey Sterk Design collection. In the case of this large, transitional coffee table, it's like having a floating piece of art right in the center of your living room. Several states have a hand in the manufacturer of Audrey Stern products, but make no mistake, it's all made in the US, from furniture made in North Carolina to wall coverings printed in Michigan. The company also has an admirable environmental commitment. Their fabric line uses an air dying technique, which uses no water. Wall coverings are available on an entirely organic canvas with organic ink as well. Both the papers and canvases use archival ink which will hold the original color for 300 years. The company only uses eco-friendly, low VOC solvents for the wallpapers. Finally, most of the materials can recycled, and some can even be returned to Audrey Sterk for recycling into future product lines. “I never wanted a production line to have waste, water pollution or effect the environment negatively,” said Audrey. Audrey Sterk Design products can be found in various decorating shops around the country, but you can also call the company direct, where Audrey herself might just be the one to answer the phone. You can find out more about Audrey and her wonderful American made collections at www.audreysterk.com.